The 1992 South African Grand Prix was a Formula One motor race held at the Kyalami circuit in Midrand, South Africa on 1 March 1992. It was the opening round of the 1992 Formula One season and was contested over 72 laps. It was the 32nd South African Grand Prix, and the 22nd as part of the World Championship. Nigel Mansell dominated the weekend in his Williams-Renault, taking pole position, fastest lap and leading every lap of the race en route to victory for the second time in his career. Mansell's teammate, Riccardo Patrese, asserted the dominance of the car by completing a 1-2 finish. Ayrton Senna completed the podium for the McLaren team. This was the first post-apartheid South African Grand Prix, the last running of the race having been in 1985 during Premier P. W. Botha's state of emergency. It was held on a revised Kyalami circuit, which used only a small part of the old layout. Mansell took pole position by almost three-quarters of a second from Senna, and set a lap time over 1.5 seconds faster than his teammate Patrese. Senna completed the front row in an updated MP4/6B as the team's 1992 chassis would not be ready until the Brazilian Grand Prix, the third race of the season. Nevertheless, Berger also managed to set a time quicker than that of Patrese's meaning he started the race from third position, and the Italian in fourth. Jean Alesi's Ferrari was the only other car capable of staying within two seconds of Mansell, as the Frenchman secured a fifth place grid slot on the same row as Michael Schumacher in his Benetton. Karl Wendlinger did well to position his March up in seventh place, while his new teammate Paul Belmondo failed to qualify. Wendlinger was ahead of Schumacher's teammate Martin Brundle, who had qualified eighth, and the other Ferrari of Ivan Capelli, who was ninth. Andrea de Cesaris completed the top ten in his Tyrrell in a time over three seconds behind Mansell's. Stefano Modena failed to qualify his Jordan-Yamaha, partly because of problems with the reliability of the Yamaha engine which, according to then BBC commentator Murray Walker, was grenading itself. The race was fairly uneventful as Mansell led from lights to flag, finishing nearly 25 seconds ahead of Patrese. Senna drove well to ensure he remained on the podium with a 1991 car, as did Schumacher, who gained from his qualifying position to complete the race in fourth place. Berger finished in fifth place and nearly 40 seconds behind his teammate; he was the last driver to finish the race on the lead lap. Johnny Herbert finished in sixth place and took the final point for Lotus. Interestingly, all of the top 6 finishers drove cars that were either evolutions of (or direct carryovers) of cars designed for previous seasons. Nigel Mansell, Riccardo Patrese, Ayrton Senna, Gerhard Berger, Michele Alboreto, Martin Brundle, Thierry Boutsen and Pierluigi Martini were the only drivers who had raced in the last South African Grand Prix seven years earlier. Coincidentally, Mansell also won this race in a Williams (albeit a Honda turbo-powered one), while Berger finished fifth in an Arrows. The McLaren team used the previous year's MP4/6 (upgraded to 'B' specification) in this race and the next, as the MP4/7A was not ready. The Coloni team had been purchased by the Andrea Moda fashion company, which signed Alex Caffi and Enrico Bertaggia and took the 1991 Coloni C4 to South Africa. Caffi drove in the Thursday morning acclimatisation session (as the revised track was new to the calendar), but thereafter the team was excluded. Andrea Moda owner Andrea Sassetti believed that he did not have to pay the $100,000 fee for new teams, as he had purchased an existing team (Footwork and Fondmetal had not had to pay this fee when they purchased Arrows and Osella respectively the previous year), but officials decided that he had purchased Coloni's cars but not its entry, leading to the exclusion. ^ "Motor Racing Programme Covers: 1992". The Programme Covers Project. Retrieved 26 October 2017. 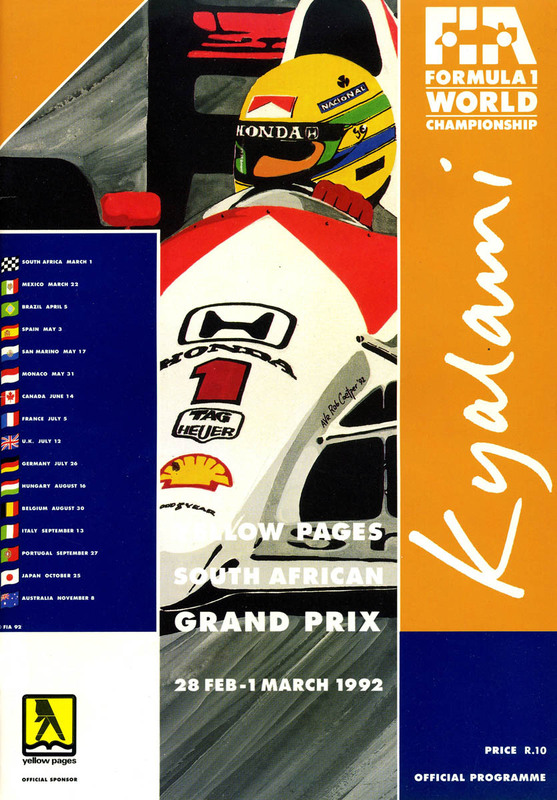 ^ "1992 South African Grand Prix". formula1.com. Archived from the original on 3 November 2014. Retrieved 23 December 2015. ^ "Andrea Moda - Full Profile". Archived from the original on 13 May 2008. Retrieved 16 January 2016. ^ a b "South Africa 1992 - Championship • STATS F1". www.statsf1.com. Retrieved 20 March 2019.